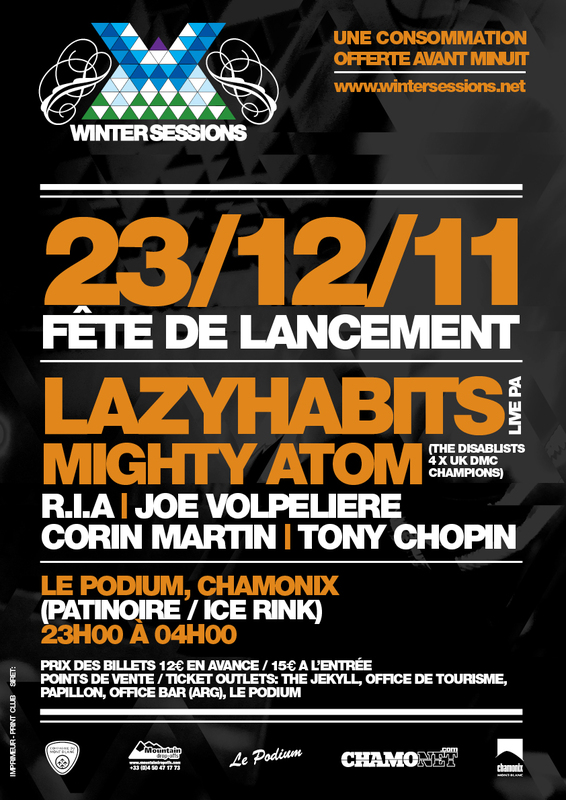 Winter Sessions are back for another season of music and mayhem in the amazing Chamonix Valley. They have events going on the piste, monthly gigs at Le Podium, some very special events with altitude as well as the Weekender Festival in March 30th and 31st going into it’s 3rd season. See Winter Sessions website for details. On the 23rd of Dec get ready for a wintery warm-up to launch the season with London based jazz hip hop heads LAZY HABITS. Back by popular demand after they well and truly smacked it at the Winter Sessions Weekender last year. Backed up the mic will be none other than THE MIGHTY ATOM with his crew, The Disablists, who has taken out the UK DMC Champs 4 times in a row. Then, me R.I.A be laying down chunky funk jams to get the party started… And just so you can feel some serious base in your face, the WS crew are importing the Funktion One sound system for the third season in a row – Yeah boieeeee!